After successful involvement in a glass manufacturing company (eventually sold to Libbey Owens Ford) brothers Joseph B., Robert C., and Ray A. Graham began in 1919 to produce kits to modify Ford Model Ts and TTs into trucks. That led to the brothers building their trucks using engines of various manufacturers and the Graham Brothers brand. Eventually they settled on Dodge engines, and soon the trucks were sold by Dodge dealers. The Grahams expanded from beginnings in Evansville, Indiana, opening plants in 1922 on Meldrum Avenue in Detroit, Michigan of 13,000 square feet (1,200 m2), and in 1925 on Cherokee Lane in Stockton, California. The Canadian market was supplied by the Canadian Dodge plant. Dodge purchased the Graham Brothers truck firm in 1925, and the three Graham brothers took on executive positions at Dodge. The Graham Brothers brand lasted until 1929; Chrysler Corporation having taken over Dodge in 1928. In 1927, with the banking syndicate controlling Dodge trying to sell the company, the Graham brothers decided to enter the automobile business on their own. In 1927, they purchased the Paige-Detroit Motor Company, makers of Paige and Jewett automobiles, for $3.5 million. Joseph became president, Robert vice-president and Ray secretary-treasurer of the company. The company's initial offering included a line of Graham-Paige cars with six- and eight-cylinder engines. For a while a line of light trucks was offered under the Paige name, soon discontinued when Dodge reminded the Grahams about the non-competition agreement they had signed as part of the sale of the Graham Brothers Company. Grahams earned a reputation for quality and sales quickly rose. Graham also had some success in racing, which helped boost sales. The Graham company logo included profiles of the three brothers and was used in insignia on the cars including badges and taillight lens. Graham-Paige made most of their own bodies and engines. The Graham brothers had solved a long-standing Paige body supply dilemma by purchasing the Wayne Body Company and expanding with other body plants. They did not have a foundry and contracted with Continental for these services relative to their engines. Some models did use Continental stock engines. Graham-Paige's own engineering department designed most of the engines used in Graham-Paige cars. The 1938–1940 "Spirit of Motion" cars and Hollywood models are frequently incorrectly stated to use Continental engines. After World War II Continental produced a lesser version of Graham-Paige's 217-cubic-inch-displacement engine used in the previously mentioned models. These engines were used in the post-war Kaiser and Frazer automobiles. For engineering, the rear kickup on the chassis frame was eliminated by the adoption of a 'banjo' frame. Unlike contemporary practice, the rear axle was placed through large openings on both sides of the frame, with rubber snubbers to absorb any shock if the car axle should make contact. This in turn permitted a wider body. To help lower the car, the rear springs were mounted on the outer sides of the chassis frame and not under the frame. This idea was eventually copied by other manufacturers - Chrysler, for example, in 1957. For 1934, Graham introduced a crankshaft-driven supercharger. At first offered only in the top eight-cylinder models, when the eights were dropped for 1936, the supercharger was adapted to the six. The unit was designed in-house by Graham Assistant Chief Engineer Floyd F. Kishline. It was an original design, not a Switzer-Cummins or Duesenberg design. Through the years, Graham would produce more supercharged cars than any other automobile manufacturer until Buick surpassed them in the 1990s. By 1935, the "Blue Streak" styling was getting rather dated. A restyling of the front and rear ends for 1935 proved to be a disaster, making the cars appear higher and narrower. Having no money for a new body, Graham signed an agreement with Reo Motor Car Company to purchase car bodies, paying Reo $7.50 in royalties for each Hayes-built body. The engines did have new full water jackets. Graham added new front end styling and revised detailing to these bodies to create the 1936 and 1937 Grahams. Amos Northup of Murray Body was hired to design a new model for 1938, but he died before the design was complete. It is believed the final design was completed by Graham engineers. The new 1938 Graham was introduced with the slogan "Spirit of Motion". The fenders, wheel openings and grille all appeared to be moving forward. The design was widely praised in the American press and by American designers. It also won the prestigious Concours D'Elegance in Paris, France. Wins were also recorded in the Prix d'Avant-Garde at Lyon, the Prix d'Elegance at Bordeaux, and the Grand Prix d'Honneur at Deauville, France. Its cut-back grille later gained the car the name "sharknose", which appears to have origins in the 1950s. The styling was a complete flop in sales. The most reliable estimates, from period publications, suggest the total production of all 3 years of these cars is between 6000 and 13,000 units. With this low production Graham limped through 1939 and 1940. Desperate for a winning offering and unable to retool, Graham made a deal with the ailing Hupp Motor Co. in late 1939. According to the deal, the faltering company entered into an arrangement with Hupmobile to build cars based on the body dies of the stunning Gordon Buehrig-designed Cord 810/812. In an effort to remain in business, Hupp had acquired the Cord dies, but lacked the financial resources to build the car. Graham agreed to build the Hupmobile Skylark on a contract basis, while receiving the rights to use the distinctive Cord dies to produce a similar car of its own, to be called the Hollywood. The striking Skylark/Hollywood differed from the Cord from the cowl forward with a redesigned hood, front fenders and conventional headlights, achieved by automotive designer John Tjaarda of Lincoln-Zephyr fame. The Cord's longer hood was not needed, as the Hupp and Graham versions were rear-wheel drive. This also necessitated modifying the floor to accept a driveshaft. The Hollywood was available in a standard 6-cylinder version and a supercharged version. Each engine was manufactured by Graham-Paige itself. However, the Hollywood did not stop the company's slide. After its public introduction, orders poured in. However, manufacturing difficulties caused months of delay before deliveries began. Customers tired of waiting, and most of the orders were cancelled. Despite an enthusiastic initial public response, the car actually ended up being a worse flop in the sales department for both Graham and Hupmobile than either firm's respective preceding models. The company suspended manufacturing in September, 1940, only to reopen its plant for military production for World War II. The company resumed automobile production in 1946 producing a modern-looking new car, the 1947 Frazer, named for new Graham-Paige President Joseph Frazer, in partnership with Henry J. Kaiser. It also began production of farm equipment under the Rototiller name. In August 1945, Graham-Paige announced plans to resume production under the Graham name, but the plan never materialized. On February 5, 1947, Graham-Paige stockholders approved the transfer of all their automotive assets to Kaiser-Frazer, an automobile company formed by Frazer and Kaiser, in return for 750,000 shares of Kaiser-Frazer stock and other considerations. Graham's manufacturing facilities on Warren Avenue were sold to Chrysler, who used the plants first for DeSoto body and engine production, and finally for assembly of the Imperial for the 1959, 1960, and 1961 model years. In 1952, Graham-Paige dropped the "Motors" from its name and branched into real estate, and under the direction of Irving M. Felt, bought such properties as the Roosevelt Raceway in New York, and in 1959 a controlling interest in the old Madison Square Garden (built 1925). In 1962, the firm changed its name to the Madison Square Garden Corporation, which was later absorbed by Gulf & Western Industries. Currently Madison Square Garden is part of Madison Square Garden, L.P., of which a majority interest is owned by Cablevision Systems Corporation. Graham Model 97 Supercharger 4-door Sedan 1939 "Spirit of Motion", later nicknamed "Sharknose"
Graham-Paige 835, introduced at the New York Auto Show in January 1928. 1 2 3 4 5 6 7 8 9 10 11 12 13 14 15 16 17 18 19 20 21 22 23 24 25 Odin, L.C. A concise guide to Graham-Paige. Belvedere Publishing, 2016. ASIN: B01G8X5Z34. ↑ Keller, 1988, p. 42. ↑ Keller, 1988, p. 101. ↑ Ritzinger, André. "Graham Model 97 Supercharged". www.ritzsite.nl. Retrieved 10 July 2013. ↑ Keller, 1988, p. 91. Keller, ME (1988). 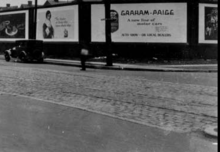 The Graham Legacy: Graham-Paige to 1932. Turner Publishing Company. ISBN 1-56311-470-4. Wikimedia Commons has media related to Graham-Paige vehicles.